Very Very Vicky: A Little Shopping! What Would You Choose? It won't be long before the electrician will be starting his job and he will want to know where to place the dining room chandelier. Since I want to hang it over the center of the dining room table I need to select one so I will have the dimensions. 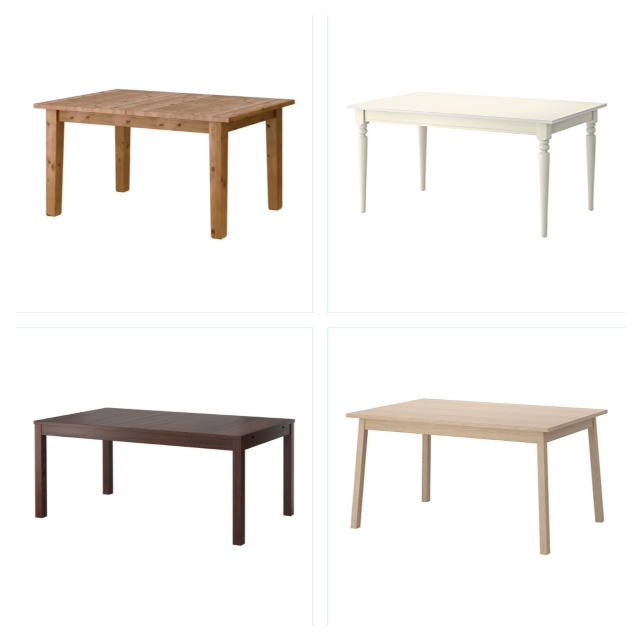 I went to the IKEA website and decided to go with a rectangular table that extends. My favorites were Stornas in the antique stain (top left) and Ingatorp in white (top right). Don't you just love the names IKEA gives its products? It has pretty legs and it is a bit narrower than Stornas. Since you need about 3 feet for each chair to pull out and have room to seat someone, narrow is good. Also, in small spaces it is good to let furniture take up less room visually--since the walls will be white, a white table will blend into the background a bit and make the room feel bigger. Now I need to cross my fingers and hope they still carry it when I can get there to buy it!